TelePad-4 keeps your iPhone close to hand. If you like the idea of breaking out your iPhone 4 and one or more of its many fine music making apps during a live performance, Primacoustic's TelePad-4 mic stand adapter could help you out. 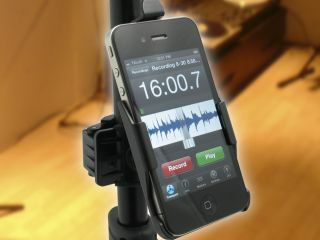 This, quite simply, enables you to mount your iPhone 4 to a mic stand. It features a quick release high-impact cradle and a clamp that can be rotated 360 degrees. This means that you can use your iPhone in both landscape and portrait modes, and it's also worth noting that the clamp is designed to be attached to the likes of music stands, hi-hats and cymbal stands too. "The new iPhone 4 is already selling at record levels and we wanted to make sure our customers had an immediate solution on hand," says Primacoustic Sales manager Steve McKay. "The TelePad-4 is perfectly suited for chord charts, backing tracks, guitar tuner and lyrics for those that play live." The TelePad-4 is available now priced at $35.